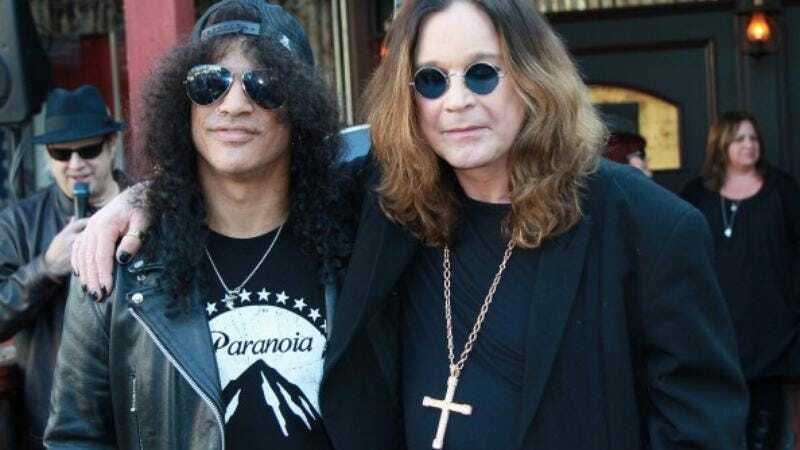 Ozzy Osbourne and Slash, two men whose reputations as musicians are superseded only by their reputations as people who have a pretty hard time keeping a band together, have decided to team up once again. The pair, along with Black Sabbath bassist Geezer Butler and Rage Against The Machine and Audioslave’s Tom Morello, are putting together a one-night-only metal supergroup as part of the lineup for 2015’s Voodoo Music Experience in New Orleans. The group will be performing their set on Halloween night—which seems fitting, given how much time most of its members spend in costumes. The group is simply billed as “Ozzy Osbourne Featuring Geezer Butler, Tom Morello And Slash,” but there’s still plenty of time for them to come up with a real name—Dads In Guyliner? Grey Sabbath? Rage Against The CPAP Machine?—before October rolls around. Osbourne’s group is just part of the festival’s line-up, which will also include a set from headliner Florence + The Machine, as well as The Zac Brown Band, Chance The Rapper, and Modest Mouse. You can see the entire line-up for the festival, which runs from Oct. 30 to Nov. 1, below.